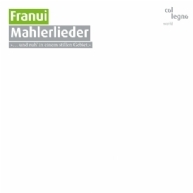 The Mahlerlieder album concludes Franui’s trilogy about the art of the Lied in the 19th century, as the final sequel to its predecessors Schubertlieder (2006) and Brahms Volkslieder (2008). Most of us – we have been playing together in nearly the same line-up for 18 years now – originally come from Innervillgraten, a tiny East Tyrolean village situated 1,402 meters above sea level near the border to South Tyrol. Also located there is a mountain pasture known by the name of “Franui,” after which we have named our Musicbanda (the Rhaeto-Romanic field name indicates the geographical proximity to the Dolomites, where Ladin is still spoken today). A walk from Innervillgraten up the Toblacher Pfannhorn will afford you a wonderful view not only of the Drei Zinnen and the Große Schusterspitze but also down as far as Altschluderbach, a hamlet of Toblach, and into the forest, where Gustav Mahler’s last composing hut can still be visited today. Here, where the roving eye is caught by the lush green pastures of Toblach and Niederndorf farms, where the gentle southern slope of the Pfannhorn bears your soul and your sentiment into faraway lands, where these days you need yourself in the middle of the “game preserve Gustav Mahler” and have to pay admission for being allowed a glimpse of red deer and wild boar and the Master’s composing hut ... here is where, during the summers of 1908, 1909 and 1910, the brilliant “holiday composer” wrote his Lied von der Erde, his Ninth Symphony and the drafts for his unfinished Tenth. This is the (scenic) background to our appropriation of Gustav Mahler’s music. With our battery of sounds comprising woodwind and brass, bowed and other string instruments (such as the dulcimer and the harp) we aim at being, not interpreters but narrators of music. Based on a selection of works from Mahler’s Lieder oeuvre (we have used not only the Rückert and Wunderhorn Lieder but also the Lieder eines fahrenden Gesellen and the Kindertotenlieder) we attempt to shift the perspective: the listener gets to know how this music was created – and what came after it. Where does the sadness come from? Is is in a way an idle speculation, because those who know the answer will not have understood the question. Certainly not where the sadness under consideration is that which permeates Mahler’s lieder. Andreas Schett, Markus Kraler and all the other wonderful musicians of the Musicbanda Franui, on the other hand – they seem to know something. Once you have heard them play, and if you are in search of something – the source of sadness, maybe, or the mystery of beauty – you are ready to go along with them. A kind of expedition to the beginnings of sadness. At these light-heartedly lamenting mourners know where they need to search, is apparent even in their somewhat panicky, or leastways manic, remotely cheerful songs. Take the one they play at the beginning of the concert I saw in Erl, at the local concrete basilica that proudly cranes its neck like the alpine giants around it. “Wenn mein Schatz Hochzeit macht” (When my sweetheart is married), is the name of the song they re away with. But I can feel a twinge somewhere. It soon becomes clear what causes the twinge. Andreas Schett comes up to the microphone, a figure of tragicomic dimensions, a quality emphasized by the fact that he is clearly aware of it. “We’re called Franui,” he says, in East Tyrolean dialect, spelling out each letter, almost in a stutter. “We’re called Franui.” Bong. First tragicomic crash. “We used to reflect a lot. But we don’t anymore.” Bong. Second tragicomic crash. These are statements somewhere between Ödön von Horváth and Christoph Marthaler, hinting at a mountainous existentialism, as if Beckett had been, not a writer but an alphorn player. Those who aim high, this beginning implies, those who don’t know how to fall really deep, the voice says, better abandon the search at once, better leave right away. “We used to play mainly funeral marches,” Schett says next, with comical solemnity. “Now we play other things, too.” Other things, too. How empty they appear, those other things, how bare, so much less comforting than the funeral marches. Other things, too. The things that are beyond, not this side of, the funeral marches. Might be funny. But aren’t. That much is clear. Beyond the grief. Franui is the name of a mountain pasture in the small Austrian (East Tyrolean) village of Innervillgraten, 1,402 meters above sea level, where most of the Franui musicians grew up. The Musicbanda of the same name, who have been playing together in nearly the same line-up since 1993, produce an immediately recognizable sound (due to the special blend of woodwind and brass, bowed and other string instruments). Franui are regularly invited to perform at major festivals and venues (e.g. Wiener Festwochen/Konzerthaus Wien, Burgtheater, Wiener Staatsoper, Mozarteum Salzburg, Tiroler Festspiele Erl, Philharmonie Luxembourg, Kunstfest Pélerinages Weimar, Schauspielhaus Hamburg). For the 2005 Ruhrtriennale in Duisburg Franui produced the song-play “Steine und Herzen” (Stones and Hearts) in collaboration with director and actor Sven-Eric Bechtolf. The music and image theater project “wo du nicht bist” (where you are not) was realized in collaboration with the Berlin theater group “Nico and the Navigators” for the 2006 Bregenzer Festspiele and was also performed in Berlin, Munich, Parma and Mulhouse. In 2008 the Bregenzer Festspiele hosted the premiere of Franui’s program “Nur ein Gesicht” (Only One Face), a musical reflection on Johannes Brahms’ Deutsche Volkslieder. In the course of 2009, on the occasion of the 250th anniversary of the death of G. F. Händel, Franui’s pasticcio opera “Anaesthesia” was performed in several European cities, e.g. at the Händelfestspiele in Halle/Saale, the Grand Théâtre de Luxembourg, the KunstFestSpiele Herrenhausen/Hannover, the Radialsystem in Berlin and the Bregenzer Festspiele (again in collaboration with “Nico and the Navigators”). In June 2010 the “Mahlerlieder” premiered at the Ludwigsburger Schlossfestspiele. Composers Markus Kraler and Andreas Schett and their ten fellow musicians, jointly operating a battery of sounds comprising woodwind and brass, bowed and other string instruments, take Mahler’s Lieder seriously while at the same time expanding them by a contemporary range of sounds. In doing so they shift the perspective: The listener gets to know how this music was created – and what came after it. Franui & Bechtolf, Brahms & Horváth! Highly recommended. "Only one face": Following their price-winnig recording Schubertlieder, the Tyrolean Musicbanda Franui have now taken up Johannes Brahms’ German Folk Songs.